As videogames begin to realistically duplicate the movements of real athletes, they're gaining popularity as training tools. Sports gaming has seen a vast increase in detail and realism, and more coaches and athletes are seeing the benefit of including games as part of an athlete's training regimen. 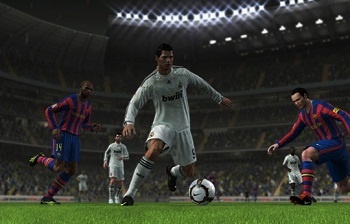 In current-generation sports games, the characters are finely tuned to model the movements and play style of their real-life counterparts. "You really get to see and experience the players' style of play," Major League Soccer forward Connor Chinn said. "After I face a guy on the field, you can see how very similar the movements and actions are in the videogame." For many athletes who play physical games like soccer or hockey, these games are a great way to get into the right mindset before training. They can also help injured players keep focus while they are unable to take part in traditional play. Naturally, the games do not replace physical training, but used in conjunction they can help players hone their play and even increase teamwork if the teams play the games together. For other sports such as NASCAR, games can go even further. NASCAR driver Joey Logano uses gaming simulations to prepare for races. NASCAR regulations prohibit test-driving actual tracks, so Logano and a number of other NASCAR drivers use the racing simulator at iRacing.com in order to virtually drive new tracks or even go over older, familiar tracks. "The graphics are really close to the real thing," Logano said. "You get to experience any turn or bump." Sometimes the games can become a hindrance, in 2006 Detroit Tigers pitcher Joel Zumaya was unable to pitch due to inflammation suffered from playing too much Guitar Hero. But some trainers do acknowledge their use. Texas Rangers senior adviser John Hart says games should not be used in the clubhouse when the athletes are preparing for a game, but at other times, they can be a positive experience for the players. "You want your players to be relaxed and have a certain camaraderie," he said. "Players used to play golf or even hang out at bars years ago. Now they play videogames with each other." Gamers who often play together can attest to the powerful camaraderie it can create. Here's hoping none of them screen-watch.